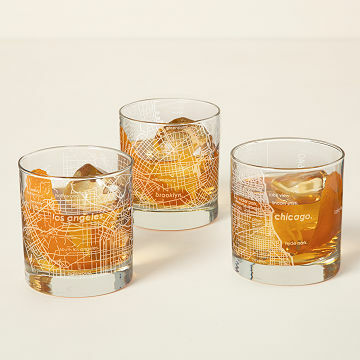 Take a mental stroll through familiar streets with this rocks glass, etched with your city's distinct grid. Something about sipping a full-bodied bourbon after work brings you right back to that local watering hole where everyone actually did know your name. Whether you had your initials carved on the corner bar or you simply miss your favorite metropolis, this glass set lets you raise a toast to hidden gems and great memories with designer detail. Created by Boston-based designer Brian Johnson, these glasses feature an intricate city map that sprawls along the curves of the vessel. Interspersed street names and the locale's coordinates offer an unexpected way to show off your own stomping grounds. Glasses made in Ohio and etched in New Hampshire. Sold individually. Unfortunately, this item cannot ship outside of the United States at this time. The cycling enthusiast in your life will love our exclusive Bike Map Glasses. Yes, as a gift for the man who already has everything. I got this for a birthday gift for my husband, haven't given it to him yet, but I am super excited about it! It's personalized to our city, he loves maps and it's also useful. I think he's going to really love it! This product is nice, heavy duty, and I hope dishwasher safe. We will likely be buying more of these in the future for friends and family who like unique stuff but are difficult to buy for. My brother uses the product by displaying it on his bar cart and using it every day or to entertain guests. I'm told anyone he's received lots of compliments on them! These glasses are a definite crowd pleaser! Great sentimental but useful gift! So useful and perfect to remember a special place! Great to look at & use! Love how personal yet functional it is! Reminds people of their hometown and they love them. Very unique gift! This was gift and they loved it!! !